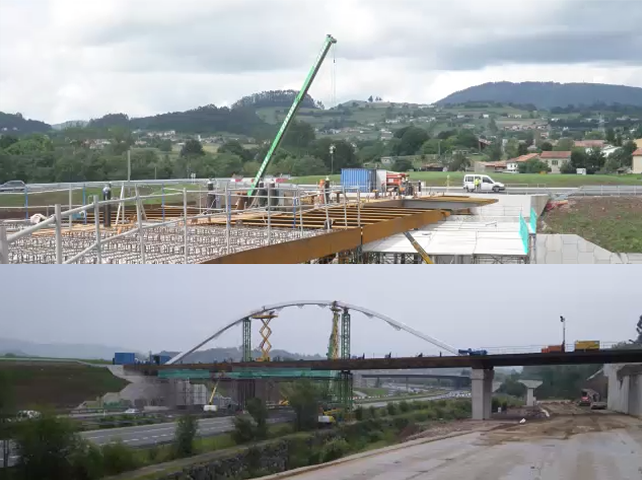 New bridge structure over A-8 (road), in Asturias. An Energy Efficiency Management Workshop was held this past 14th of March, at the Club Asturiano de Calidad (Asturian Quality Club) of the Asturias Company. The results of a pioneering project in the implementation and certification of Energy Efficiency Management Systems were presented during the event. The Centro Tecnológico Iglesias participated together with 6 other Asturias companies. During the event, our companies, Contratas Iglesias and Centro Tecnológico Iglesias, received UNE-EN 16001 certification. The AENOR Development Manger, Mr. José Luis Tejera, the General Director of Mining and Energy of the Principality of Asturias, Mr. Isaac Pola, and the General Manager of IDEPA Mr. Carlos García Morilla took part in this meeting. In a written notification addressed to the United Nations, dated the 28th of February 2011, Contratas Iglesias S.A. joined the Global Compact. This United Nations instrument is for companies, trade union and Non-Governmental Organizations (NGOs) who have a voluntary commitment to implement the 10 principals in areas related with human rights, work, the environment and corruption. Contratas Iglesias is marketing the first Moduluc Business Park industrial buildings. The urban development works in the first phase are finished and the start of construction for industrial buildings is expected at the beginning of 2011. The first phase is developed in a 46,000 m2 setting and is aimed at different business sectors. There will be an abundance of business diversity due to the modular system that allows for different compositions. Industry, logistics, technology, banking, and business are just some of the business sectors that will have their premises located at Moduloc. Moduloc Business Park is located in the old Locsa currency manufacturing plant, an ideal industrial area in the Asturias region. We have information and sales offices in the vicinity of the Business Park. Contratas Iglesias, together with the University of Cantabria, in collaboration with seven European Universities, contributes to the advance of a Post Graduate Training Program titled: Master’s in European Construction Engineering. The main objective is to expand the academic training and preparation of (university) graduates in the business world, in which case, Contratas Iglesias plays an active role. This one-year, full-time Master’s is of an on-site nature. In April, Contratas Iglesias was a component of a 31-company group participating in an institutional and business delegation traveling to Central America to visit the Dominican Republic, Panama, Mexico and Cuba. The group was lead by Vicente Álvarez Areces, president of the Principality of Asturias. Growth and economic recuperation, as well as the number of business opportunities available in these markets have sparked the interest of the firms participating in the project. A number of high level encounters were organized with organizations and companies in those countries visited. The official visit sought to facilitate commercial exchange and collaboration between companies while at the same time, present Asturias as an international investment destination, where there is a solid business fabric, ample know-how and experience as well as the necessary size to collaborate in the development of industry, technology and infrastructures. A lo largo de este año Centro Tecnológico Iglesias, S.L participa junto con otras 5 PYMES, en un proyecto piloto del Principado de Asturias, que persigue el diseño, puesta en marcha y evolución de Planes de Mejora e Innovación sobre Eficiencia Energética y su gestión, tomando como referencia el modelo de gestión recogido en la Norma UNE-EN 16001:2010 “Sistemas de Gestión Energética”. Burial of the F.E.V.E. railway lines in Langreo and the landscaping of the corresponding grounds granted to Contratas Iglesias. The cornerstone of the railway tunnel in Langreo marks the path of the tramway for the Nalón area. Angel Villalba, President of Feve, stated yesterday in Sama that the company is in a position to operate with a train-tram on the Gijón-Pola de Laviana line by the end of 2012, once construction has concluded to eliminate the railway tie-up in Sama and La Felguera. Contratas Iglesias is one of the seven innovative companies in Asturias to participate in the project for the Certification of R+D+i Management Systems. The goal was to facilitate the implementation and certification of R+D+i Management Systems according to UNE 166.002 norms to be able to prepare, document and structure innovation activities according to R+D+i management norms. José Manuel Iglesias, President of Contratas Iglesias, accepted the Ladrillo de Plata Award in the ‘Contractors’ category from Serafín Abilio Martínez in recognition of the important professional career.